Any craft that involves inexpensive materials from the dollar store is an immediate winner in my books, because can we all agree that craft materials can get SUPER expensive super fast? Not this time! I wanted to bring a little of the festive spirit into our master bedroom, but with curious little hands coming at everything, I didn’t want to take my chances with a tree or any small ornamental things – and that’s how I became known as the crazy wreath lady, because after hanging these up I officially have 12 wreaths hanging in my house this season. Whoa! They’re so cute, though, I couldn’t help it! For starters, cut all of your branches so that only the leafy bits are left behind. They probably shouldn’t be any longer than 8-12″ so that they can be easily wrapped around the embroidery hoop. Tie a piece of the clear string around everything so one end of the branch is attached to the hoop, then wrap the string all the way around, adding new pieces as you need. Cur off the excess string and you’re done! I chose to do mine all different from one another, but a collection of wreaths that are all the same would be cute, too! As you can see by the state of my island, beware of glitter! It got on EVERYTHING, but that’s part of the magic of Christmas, right? I hung mine up using a mixture of small finishing nails and Command hooks because I normally have a large piece of art that goes above our bed, so I wasn’t too worried about nail holes. Plus, they’re tiny! I used a Command hook for the heavier wreaths and the one hanging from the ribbon. Oh, and don’t worry. The glitter isn’t an issue anymore. I was half expecting to wake up with gold sparkles on my face the next morning, but everything has stayed put! I can already tell you that I will be sad to see these go once the Holiday Season is over! 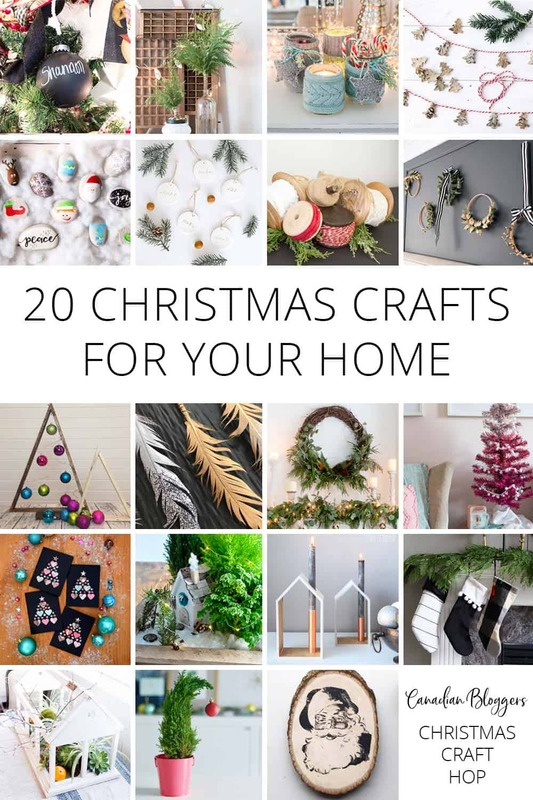 Now, because it’s your lucky day, there are 19 other Holiday crafts by Canadian bloggers that you can go see today! They’re all listed below, so go check them out. So chic, Thalita! I love embroidery hoop wreaths. Your styling of them is gorgeous! Where is that ribbon from? I love them all. Dollar store projects for the win! These are lovely. These wreaths are so chic and beautiful, Thalita! They look great hanging in a grouping, too. The use of clear stretch cord is a great crafting tip! I’m definitely going to get some for my own projects now! Those wreaths on that dark wall… I’m seriously looking around my house now, I need a dark wall, such a stunning colour the perfect backdrop for those fantastic wreaths! this is a very cute project idea. I really like how you created a collection- just darling! I love what you can find at the dollar store these days! What a clever idea! I want to make a really large one for above my fire place. Well aren’t these adorable! Plus they’re cost effective. I’ve gotta make myself some! I also love their placement above the bed – nice touch! I love your five golden rings -er wreaths. So pretty and festive, the perfect little Christmas DIY. hahaha I hadn’t even thought of that! Thanks, Dannyelle! Lovely! I really like the gold with black and white combinations, very classy!